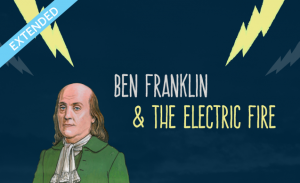 Win $1000 in the Ben Franklin & The Electric Fire Scholarship Competition | Back to Basics Learning Dynamics, Inc.
Benjamin Franklin was the first person to figure out how static electricity works. In his experiments, he used wax, glass tubes, and, of course, people. He had his subjects stand on wax, rub glass tubes, and touch each other, and he observed and recorded the sparks that flew. While Franklin called the sparks he saw “electric fire,” his notion that electricity was actually collected, not created, was an important step forward in our understanding.